The idea of riding 3000km of roads which stretch two seperate islands and encompass beautiful scenery, mountain pass climbs, unpaved off-the beaten track roads, vineyards stretching into the horizon & costal points that are entrenched with Maori history is an opportunity I couldn't say no to! This is New Zealand, the land of the Long White Cloud, a place which we Maori call Aotearoa. In November this year I will be cycling almost 3000km across the length of New Zealand. Whilst I see this as a fantastic opportunity see New Zealand from the saddle, the true motive behind this challenge comes from a significant event that happened in my life, an event that has made me question my purpose and think about the true significance of life and mortality . On the 20th September 2010 my father, Ken Therin, passed away after being diagnosed with small cell lung cancer only 48hours previously. I was left with a grieving mother, a family home to empty and anger coupled with heartbreak. I had lost the one person in my life who I resembled, the one male figure who knew me best and still loved me for who I was. Since his passing I have struggled with my emotions surrounding cancer and it's made me realise that no-one can face cancer alone. 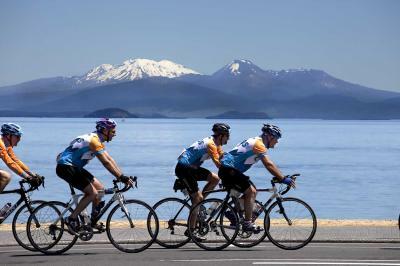 For this reason, I want to do this NZ Cycle Challenge on behalf of Macmillan Cancer Support. I hope to raise £2,500 in total so that I can support a charity which is very close to my heart. Your support and generosity in this life-changing event would be much appreciated. Follow me on Twitter and Instagram for updates and feel free to share my page with other cycling enthusiasts and people who have been touched by cancer.